The finale of the second edition of the Creative Business Factory is behind us! 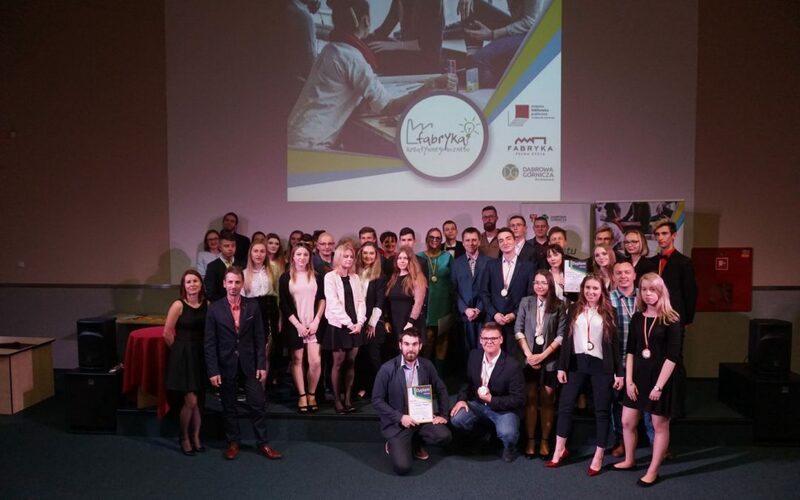 For half a year, young entrepreneurs worked on proprietary business ideas that would have a chance to exist in the premises of Fabryka Pełna Życia in Dąbrowa Górnicza. In comparison to the first edition – this time all seven teams managed to reach the end of the project. Participants represented the following schools: I High School for them. W. Łukasiński, Second High School for them. S. Żeromskiego, Zespół Szkół Ekonomicznych and V High School for them. J. Zamoyski. The duration of the editing team supported mentors Anna Urbańska (Studio Creative annanas), Isabella Gil (Association of Entrepreneurs Basin), Michael Kucharski (Association « Przedsięciorcy of Choice »), Przemyslaw Lichołap – (Association Przesiębiorców Basin), Matthew Ciszewski (Horror Escape Room ), Marcin Pałys (FURIA Feature Center) and Przemysław Lis (Zagłębie Association of Entrepreneurs). This year’s jury: Ewa Fudali (Head of the Office of City Development and Investor Services), Magdalena Mike (Deputy Head of the Department of Non-Governmental Organizations and Active Citizenship), Tomasz Kasprowicz (Academy WSB), Paul Badura (Advertising Agency Komart) evaluated the presentations of teams according to established criteria, including idea for a business related to the Full Life Factory, analysis of the competitive environment, marketing channels, or innovation of assumptions. The combination of youthful courage and experience gained over the last months has brought many interesting ideas and solutions. For the best project was « Sweet Crush » by Angeliki Warzecha, Michael Sikorski, Jakub Koziol and Claudius Walnika (Secondary School), who thus won the title of « Young business leader. » The second place was taken by the group from the 1st High School composed of: Natalia Bełtowska, Julia Krzynówek, Weronika Mikuła and Błażej Batoryna, who presented their vision of the company named. « Cafe Full of Life ». The third place went to the female team from the Second High School: Agnieszka Dziudzi and Patrycja Gawor and their concept of « Fabryka Urody ». The winners were awarded with commemorative diplomas and medals, as well as attractive prizes (including gift cards, new releases or electronic devices). We congratulate the winners and all participants! The third edition of the Creative Business Factory is planned for autumn this year. Patronage: President of Dabrowa Mining, Rector of the Higher Technical School in Katowice, Rector of WSB in Dabrowa Mining, Dabrowska Business Council, Academic Business Incubators, Scientific Society for Organization and Management. Media patronage was provided by TVP3 Katowice. Partners: Association « Entrepreneur of Choice », the Association of Entrepreneurs Basin, Civic Activity Center, Studio Creative annanas, Horror Room Escape, FURIA Games Center Festival. 300 millions pour des innovations dans l’industrie automobile!